Airport Manager Maegan Hassell (left), Commissioner of Tourism Bruce Zagers, CEO of PrivateFly Adam Twidell and Aviation Journalist Seth Miller who nominated the Juancho E. Yrausquin Airport for this global poll. 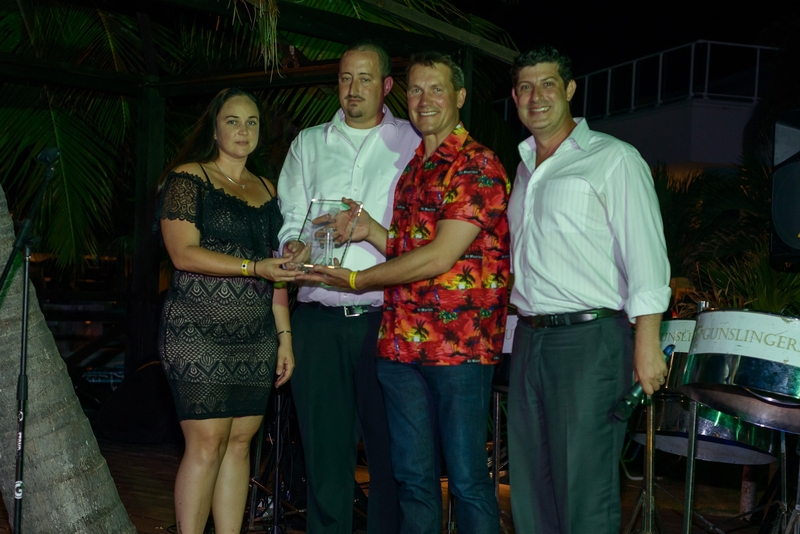 The Bottom, Saba – Last week during the aviation conference on Sint Maarten, Commissioner of Tourism Bruce Zagers and Juancho E. Yrausquin Airport Manager Maegan Hassell, were presented the award for the world’s “Most Scenic Airport Landing” by CEO of PrivateFly, Adam Twidell. Earlier in the year, PrivateFly held a month-long competition where voters could select their favorite out of the 122 airports that were nominated for the honor of the Most Scenic Landing award. Saba is proud to have won the competition and to have been the recipient of this award. The award ceremony was part of the three-day 2017 Aviation Meet-up Conference, which began on the evening of Monday, June 12th with an opening ceremony at Sky Beach Rooftop Lounge. The following days contained multiple discussion sessions and activities for the aviation and tourism enthusiasts and representatives attending the conference. Commissioner of Tourism Bruce Zagers, Airport Manager Maegan Hassell and Junior Policy Advisor Nicole Johnson represented Saba at the conference and were pleased with their experience and the knowledge gained from the discussions led by experts in the aviation and tourism industries. According to Government Information Services, participation to the conference was a positive and useful experience for Saba.